WinLog can be used to quickly create, edit and print a wide variety of borehole and well logs. The graphical windows interface displays the log as it is changed and shows exactly how the log will look when it is printed. Boring logs and templates can be edited by pointing and clicking, making the program fast and easy to learn. The graphical interface uses the latest Windows features such as floating toolbars, popup menus, smooth scrolling, context sensitive help, and multiple windows. Version 4 of the WinLoG program uses a Microsoft Access data management system to store borehole and project data. This data management system provides you with the ability to effectively manage your project data and interface the data with other applications. A master database is used to keep track of all the projects and directories. WinLoG is a full 32-bit program and is compatible with Windows 98/NT/2000/XP or higher. The program is fully network compatible and there are discounts for purchasing network licenses. There are no limits to the number and types of borehole logs that can be created with the WinLoG program. 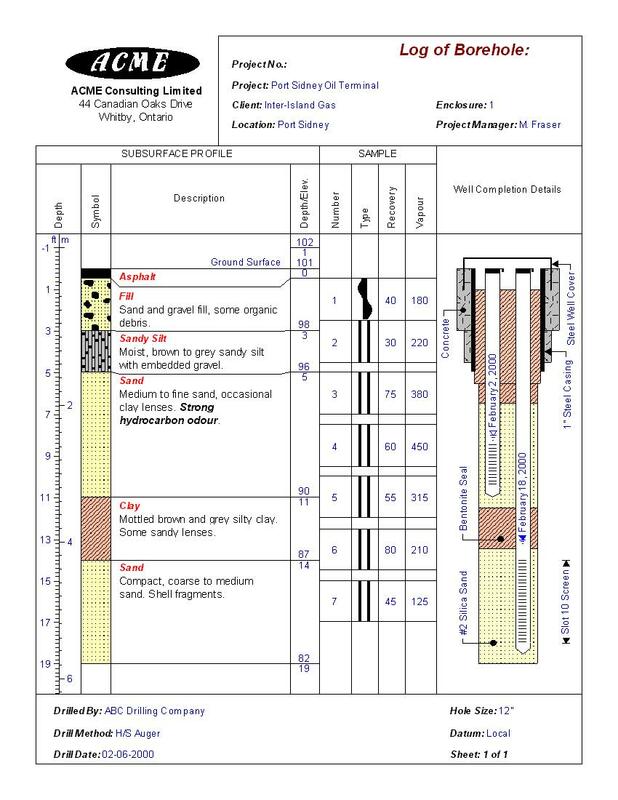 Logs can contain general borehole data; lithologic descriptions and symbols; sample data; well completion details; geophysical logs; and numerous graphs and text comments. The program comes with several easily customized templates pr new templates can be easily created. Templates can be customized to display different header and footer titles, number and types of columns. A company logo, stored as a bitmap, can also be included in a template. Legends can be created and customized to show lithologic symbol, well symbol, and sample symbol definitions. The WinLoG program has numerous features to make the creation and editing of borehole logs easier and faster. There are many new features in Version 3 and many of the existing features have been enhanced. For more information about the WinLoG program see the links below. Graphical Information System (GIS) for displaying and picking boreholes and cross-sections in WinLoG with WinFence. GIS can also display site features and import AutoCAD files. This borehole location map can also be printed and included in reports. Several types of project reports can be generated for all data in a project. Reports include general data, lithology data, sample data, graph data, water level data, etc. Deviated boreholes can be entered and displayed in true depth. Several methods for calculating true depth are supported. Deviation readings can be entered manually or imported from a file. Tables (ex. Water Level Readings) can be displayed anywhere on boring logs and templates. Templates and projects can have password locks that can be used to restrict changes to a template and access to a project. Can import data in several formats including Excel, AGS, GTGS, LogPlot, and gINT. Data in Excel can be imported into all the logs in a project at the same time. This can be used to import the survey data for all the boreholes from a spreadsheet. Borehole data can now be exported to AGS and Excel. Continuous logs are supported. These logs span several pages and do not have any page breaks. They are usually printed on tracker feed printers and are used for Geophysical and Mud logging applications. Bitmaps can now be imported in JPEG format, as well as BMP format. A new column has been added to show percent cuttings. This is used to show the percentages of different lithologies in a layer. Another new column has been added to show core photos at various depths. This is used to show the pictures of cores or downhole images. Program can now automatically update itself to the most recent version. The program searches GAEA Technologies website for any new upgrades. Program now has online technical support, where it can email technical support all relevant files and information if there is a problem. Project databases can be compressed to save disk space and speed up data access. All of the WinLoG databases are automatically backed up and can be easily restored. Symbol libraries can have default foreground and background colors for each symbol. 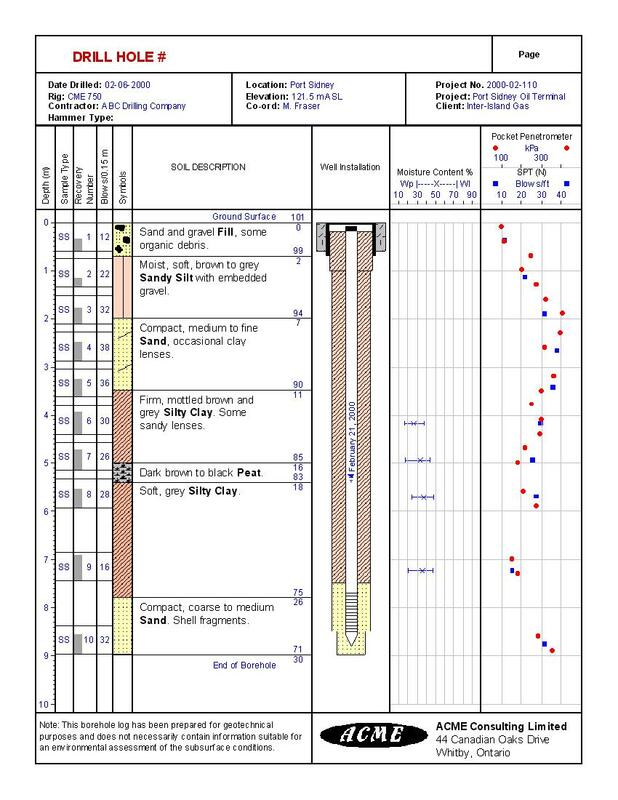 Multiple borehole logs in a project can be printed at once. Standard Windows new, open, save, and print commands. No limit to the maximum depth of a borehole log. The plot depth per page can be set in the template or changed for each log. Borehole data in the headers and footers can contain checkboxes and rich text (font type, size, color, etc. can be modified). An unlimited number of floating paragraph text boxes can be added anywhere to a borehole log. The background and frame colors can be specified individually for each text box. An unlimited number of bitmap files can be imported into a borehole log. These files can contain logos, site maps, sample pictures, etc. An unlimited number of lines, arrows, and rectangles can be added. Version 1 - 3 borehole logs can be imported. Borehole logs can be imported and exported using a text exchange format. Borehole logs can be exported to the Windows clipboard, a bitmap file, a metafile, or an AutoCAD DXF file. An unlimited number of lithologic layers can be added. Each lithologic layer can have an optional title. Macros can be used to insert selected text comments into the layer descriptions. Macros contain text and symbol definitions, and can be added and edited by the user. Layer descriptions can contain rich text (i.e. varying fonts, colors, and symbols). Symbols for each lithologic layer can be selected from an unlimited number of lithologic libraries each library contains 18 symbols. Lithologic symbols can be split vertically to display two symbols for each layer. The contact angle between lithologic symbols can be specified and used to represent gradational contacts. The program comes with over 100 lithologic symbols. Foreground and background colors can be specified for each lithologic symbol. The lines between layers can be individually customized. Core logs can be specified at separate intervals and with different lithologies than layers. An unlimited number of soil or rock samples can be added. Start depth, length, sample symbol, type, blows/ft, recovery, and other text data can be specified for each sample. An unlimited number of other sample columns can be used for a wide variety of text and numeric sample data. The lines between samples can be individually customized. Sample type symbols can be selected from 30 different symbols. Recoveries can be represented as numbers or as a shaded box. Blow counts can be shown on one line or four lines. An unlimited number of wells can be added. Wells can be shown using three different methods with varying levels of complexity. Wells can be drawn by selecting from a variety of seals, packing material, casings, screens, covers, caps, reducers, tubing, sampling ports, etc. Well completion details are drawn in vector mode to scale. Wells can contain multiple casings and screens. The diameters of the pipes and screens can be varied with depth. Horizontal and vertical text annotation can be added to the sides of the well to show completion details and other information. Annotation can be connected to well components using three different arrow styles. Multiple water levels can be annotated within wells. An unlimited number of graphs can be added to the borehole log. Each graph can contain an unlimited number of data points. Graphs can be cross-plotted with lithology. Graphs can be combined to form double graphs. Graph data can be shown as bar charts, lines, data points, or filled curves. Horizontal axis can be plotted in log or linear scale. Graph can contain a grid and point labels. An unlimited number of text columns can be added to a borehole log. Each text column can contain an unlimited number of text comments. Text comments can contain rich text, symbols, and lines. An unlimited number of geophysical logs can be imported into a borehole log. A wide variety of standard formats are supported. Geophysical logs can be cross-plotted with lithology. Either one or two geophysical logs can be displayed in a column. Templates are used to control the layout and formatting of borehole logs. In general, all of the boreholes in a project would use one or two templates to format the logs. In this way, a consistent format can be established within a project and across projects. Once a template is created it is available to all projects. New templates can be created by specifying the number of columns, the inclusion of a header and footer, page size, and page layout. Templates can have either a one or two page format. The two page format allows for a larger header or footer on the first page of the log and a more concise header or footer on the second and subsequent pages of the log. The location of header and footer titles, columns, and other text can be positioned easily and accurately. Horizontal, vertical, and diagonal lines and arrows can be drawn anywhere on a template. The thickness, style and color of the lines can be specified. An unlimited number of header and footer titles can be specified for each template, titles are then displayed when entering and displaying log data. Headers and footers can contain checkboxes that can be checked when entering log data. An unlimited number of columns can be used in each template. 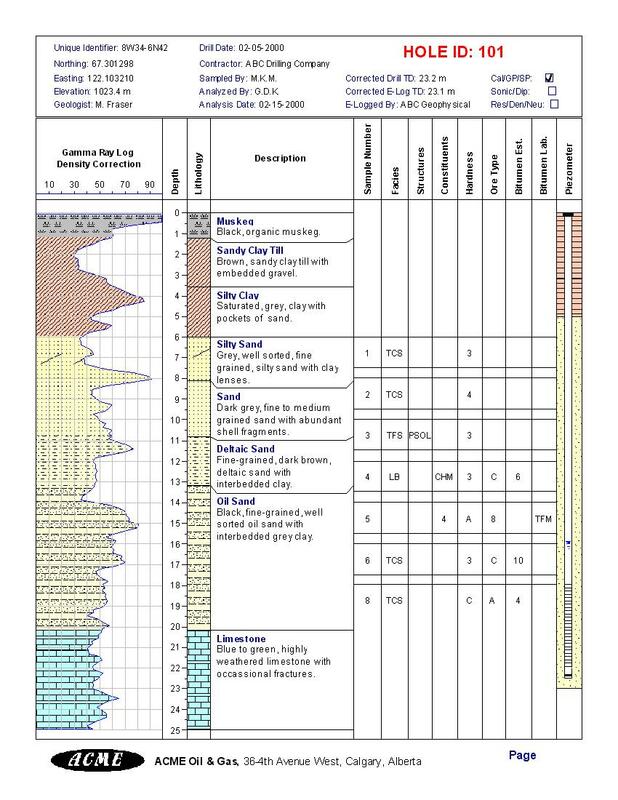 Columns can be for depth, elevation, lithologic symbol, lithologic description, sample data, well completion details, graphs, geophysical logs, or text. An unlimited number of section titles can be specified, each section can include any number of columns. Font and text color can be specified separately for headers, header titles, footers, footer titles, individual columns, column titles, and section titles. The Company Name can be entered anywhere on the template as rich text. An unlimited number of company logos, site plans, or symbols can be imported as bitmaps and placed anywhere on the template. An unlimited number of floating paragraph text boxes can be added anywhere to a template. The text is specified in rich text format. The background color and frame color can be specified individually for each text box. An unlimited number of lines, arrows, and rectangles can be specified anywhere on the template. Create a new legend by specifying lithologic symbol libraries, well symbols, and sample type symbols to include. Position of libraries and titles can be easily and accurately specified. Number of symbols per row can be specified for each library. An unlimited number of company logos, site plans, or symbols can be imported as bitmaps and placed anywhere on the legend. An unlimited number of floating paragraph text boxes can be added anywhere to a legend. An unlimited number of lines, rectangles, and arrows can be added anywhere on the legend. Legends can be exported to the clipboard, a bitmap file, or an enhanced metafile.